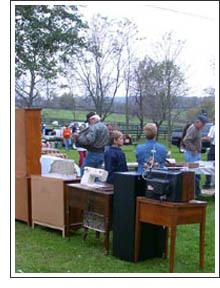 Auctions eliminate the negative haggling situation usually found in the conventional "price - wait - hope - then haggle" marketing techniques. Auctions direct a marketing plan at a targeted audience. Auctions create a definite time limit for firm offers, at a designated time and place, causing buyers to act positively and to make offers. Auctions allow you to pick the day and the hour your property can be sold rather than waiting out a long listing. Auction ads spotlight the particular property to be sold. Taking it out of "umbrella ad" category which devotes a few lines to a long list of properties. Auction signs create attention and separate the property from hundreds of properties with "ho-hum" signs that usually stay up to long and turn the buyers off. Definite terms are offered at auction, not haggled over by the buyers. The auction process (open to public bidding) allows buyers to see how many others are interested in their property. Auctions allow seller to see competitive bids on their property within a few minutes. Auctions bring out the best in people because they are held in public. Taking negotiations from behind the traditional closed doors. Auctions establish true market value. The seller finds out what qualified bidders think his property is worth at that moment.